A quick report on the recent event in this popular non-competitive MTB series took place in Ruthin. Reporter is NWMBA member Jack Nash. The No.1 event in the UK domestic calendar this year is taking place on the legendary Bala course in North Wales on 19-20 July. Pearce Cycles Race Team of Ludlow in Shropshire are organising the British Cycling sanctioned event, with support from main sponsor Red Rock Clothing. With a limited number of places still available, riders wishing to enter to earn lots of ranking points as well as race on one of the best downhill tracks in the country have only one week until entries close. A dry run for this event took place at the weekend, with 300 riders competing in round 4 of the Pearce Cycles Race Series, the super fast dusty conditions saw James Hughes take the Elite win with a blistering time of 2:49. The National Champs in July promises to be bigger and better with the race arena packed with trade stands, team pits and a spectacular six metre high road bridge made from scaffolding to launch riders into the finish arena. Expert and Elite riders must all ride in the Elite category however Expert riders will receive ranking points based on their finishing position within their own Expert category. The Senior category is a non-championship event, so no official British Cycling medals or jerseys will be awarded. If a senior rider wishes to compete for the National Championship title they may ride in Elite but are no longer eligible for Senior rankings points. The National Championships is a category C ranking event, and is therefore the most important on the domestic racing calendar. With an improved calendar for racing and endurance events in Wales and the UK, the local North Wales MTB Events scene for 2008 is looking vibrant with a NPS Downhill near Oswestry in August and this years National Championships for downhill at the popular Rhyd y Felin track between Oswestry and Bala 19/20 July, the well rated Merida 100 MTB Marathon took place at Ruthin in May, losses this year will be no Cyffylliog Challenge or Flintshire Challenge rides both the victim of the declining numbers of people willing to help and most importantly marshal on the day. Although a number of strong National riders are emerging in Downhill from the area there remains an un healthy void in local homegrown downhill events which if riders wish to come forward to talk about we would be willing to help. We would like to remind everyone we are a body of volunteers and organising races needs lots of help both setting up courses and marshalling on the day. At the moment we have too few reliable offers of help. If you think you can let us have some of your time we will try to convert that into running more events. We are likely to introduced free rides for anyone bringing an all day marshall with them and a reduced rate if one race can be covered. The first race organised by NWMBA was in August 1990, an evening event at Clocaenog Forest . The following year saw the use of the now legendary Beddgelert course for the last MBC national finals and then in 1991 the very first National Hill Climb and Downhill championships for the BMBF (now the Mountain Bike division of British Cycling) the XC Nat Champs were held at Malvern that year. 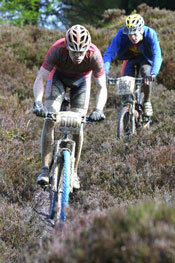 From there on the club ran 2 more National Points Series events, the premier event in the annual UK MTB race calendar. At that venue before internal property issues in the forest made it impossible to run events. The Club had been working with Forest Enterprise at Dolgellau with a view to designing a XC race course at the Coed y Brenin, at that time a sleepy forest with very little use as even the walkers were going elsewhere, the visitor centre was so unused it was being considered for closure. A brand new course being hefted out of between rocks and tree in overgrown timber stands that later became adapted by the Forest Enterprise as the popular Red Bull route. Although the course was popular it was logistically difficult to run events with the main use being the Welsh Cycling Union XC events. The club had already identified land available at Nannerch and had run a pilot WCU event there in 1993. NWMBA subsequently hosted round for the BMB NPS, the BMB National Championships and the NPS finals in 2000 at Nannerch. The venues Cross Country Course is held to be one of the hardest in the UK and is popular with the UK's top riders. The downhill course has not fared to well of criticism of late but given the type of land now required to match the technological developments with downhill bikes there are increasingly fewer suitable venues up to the required standard without large input of labour to build new courses. NWMBA Events Entry Forms can be downloaded here, as a PDF when available. We also have a dedicated discussion forum for MTB events online. If you have questions about our events or want to leave messages feel free to use it rather than phoning. The finals of this years WCU Dragon XC Series was held using some of the mountain bike trails at Llandegla Forest as well as some new track created for the race. The results are here and can be browsed online or downloaded as a text file. The race was organised by NWMBA and held on the 24th September. Entry forms and a useful information sheet telling you more about the event can be found from a link above . We will be holding more events next year so get in touch especially if you want to help us organise events. 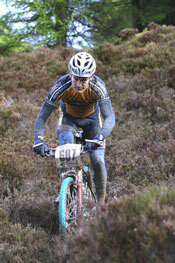 See the 2005 WCU Championships at Coed Llandegla report. MTB Orienteering returned on the 3rd September 2006 in the Clwydian Range and offered some exciting route choice issues, Many old faces came looking for a great 5 hour ride and some cracking views wiht a bit of thinking. The results are now here as a 21kb Adobe pdf for you to download... Clwydian trailquest results. WCU.... The Cyffylliog Challenge 6th August, a 50 mile fun ride with a half distance fun run was well supported and enjoyed. For many it's the best way to discover the unpromoted corners of the forest and features some paths on private land often not open for cyclists. Entry form will be here shortly. Those familiar with our classic MTB XC series 1990-1999 will recall the suffering climbs at Coed y Brenin and Gwydyr, these courses are now no longer available for racing but dedicated MTB trails have now been set up by Forest Enterprise offering a chance to ride challenging hard routes although no longer against the clock. We are advised cyclists are welcome back in Beddgelert but the trails have been tamed through improvement. Great news in 2004 that racing would return to Beddgelert later proved to be sadly wrong.. maybe next year. Our retired race director has been in Beddgelert over the winter 2004-5 talking to old contacts and we may be considering if we can resurrect the old cow again. Merida 100 Enduro round 5... after a successful inaugural event in 2003 and follow up in 2004, the majority of riders considered the new 2005 course to be the most challenging course yet in the 100km MTB marathon circuit. The Merida 100 MTB Marathon on the 18th September saw all the riders thrown at a 1200ft climb from the start then the 100km riders did a nearly 50 km ride nearly all off road. Riders comments were genearlally it was very hard but the climbs were well placed and the descents were worth the climb. The 50 km for many riders had maybe a bit too much tarmac but given it had to cater for many riders of a lesser ability. There were those who stuggled at 50 km but they did have a balanced choice of off road and tarmac with some great descents off road and most of the climbs on tarmac so be thankful for small mercies. We have taken a copy of the official results (the Merida is not a race but a challenge) the organisers MTB Marathons do not recognise an overall fastest winner in any class just those who complete the distance. However there is nothing to stop riders taking the results and comparing each others performance and breathed some life into the excel file to give you your time and the average speed and ranked by event distance and class so you can see where you came. Download from link in RH column. Good news all round we are able to report sense has returned to the National MTB scene. British Cycling have teamed up with Martin White to reformat the drab old NPS XC skirmishes where 10 riders raced in front of 20 people on a sunday. Now a weekend format the national racing will now run on the Saturday making the sunday free for a new Trek 6-4-2 Enduro which allows riders the option of a six, four or two hour marathon battle around venues which will return to classic MTB circuits of the past such as Eastridge and Newnham. There will also be a short course eliminator event on the Saturday where anyone can find them self on a line with eight riders one of whom might be National Champion.. this will all keep the commissaires busy justifying their expenses for a change. We will follow this format with interest and maybe Nannerch will return in a future year. Greater news for local downhillers two national DH events within an hours drive but the proposed DH round Dinas Mawddwy fell by the wayside.... what is it with courses in Snowdonia, they all seem jinxed. Still with an NPS Downhill at Moelfre near Oswestry and the fairly new course at Caersws near Newtown seeing NPS action again prospects for local riders to see the best in action on their doorstep is a reality this year. Ian Jones the farmer told us at the last NPS there in 2004 that he was planning to build a cross country course which with the bits of the downhill course may make a great XC event for those prefering freeride style events. We hope the Midlands Super Series guys carry on developing their courses around the Bala area although there have been changes in forest management companies recently at the venues. This is not a comprehensive list of race series but these are some national series which still roll on ( or down) and are worth the travel.